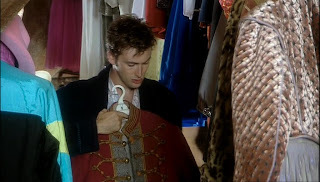 If you have been following my blogs you may have seen the coverage I have done of the costume transition scenes at the beginning of a new Doctor’s era. 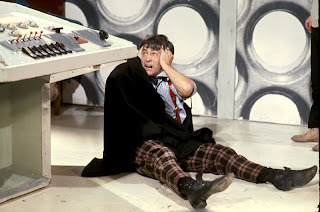 When William Hartnell became Patrick Troughton, it wasn’t just his face that changed – his costume miraculously regenerated at the same time (see right). Later, when Jon Pertwee took over, his new clothes were more realistically introduced by having The Doctor lift them from the changing room of the hospital where he is taken at the start of Spearhead From Space. 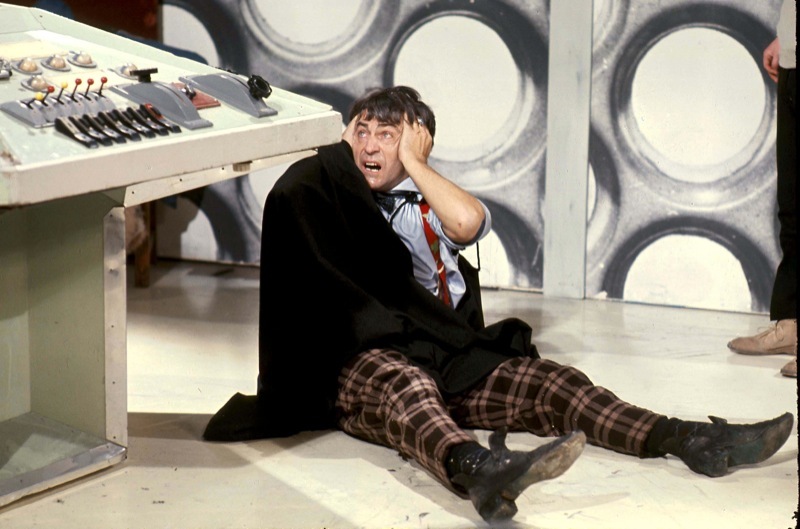 But it was Tom Baker’s transition scene that was the first to make some play on the anticipation of what The Doctor would be wearing. 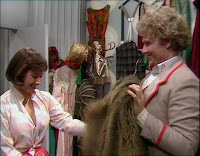 The Third Doctor steals the clothes of a hospital consultant before stealing his car as well; after the Eighth Doctor emerges from the morgue, he takes the clothes of a surgeon, who is going to a fancy dress party; the latest regeneration sees the Eleventh Doctor lifting a the parts of his costume from the hospital locker room as he strides through. 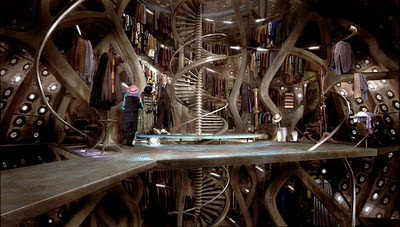 Although we don’t see the dressing-up room, the Fourth Doctor keep popping out of the TARDIS dressed in unsuitable costumes; the Fifth Doctor finds his new clothes in the TARDIS, almost as if he was supposed to; the Sixth Doctor is the first to be seen in the dressing-up room to choose his new clothes; followed by the Seventh Doctor who goes through a similar selection. We never saw a transition scene for Christopher Eccelston, so it wasn’t until David Tennant took over did we finally get a New Series spin on this classic key scene. This fell firmly under the TARDIS Dressing-up Room Scenario, with a fantastically re-imagined dressing-up room, courtesy of The Mill’s special effects gurus! 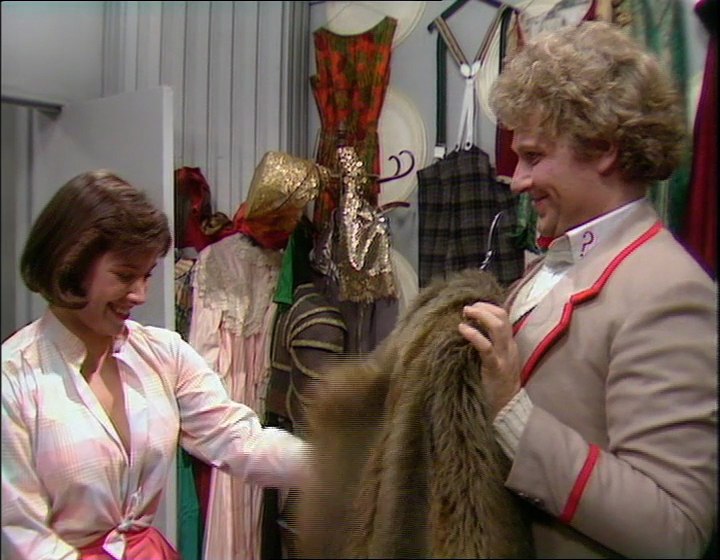 To start with we see The Doctor scanning racks and racks of clothes, pausing over a red military tunic (see left) before settling on his brown pinstripe suit and stunning long brown coat (sorry, you know how I LOVE that coat!) (see below). Of note here is a Tom Baker scarf on the right of the picture, which apparently is owned by then producer Phil Collinson – knitted by his mother! Sadly though, apart from the scarf, there is nothing relating to previous regenerations here, which is a little disappointing. But it is THIS shot that houses what we have been looking for . . . The area to look at first is to the right of centre. This is where the CGI takes over – and the costume spotters can have a field-day!
. . . on the end of the Sixth Doctor’s umbrella, which was used in The Two Doctors (see left, top) (and used again to fend off the Rani in Time And The Rani) . . . But amazingly that not all. I am also told there are other bits hidden amongst the the generic stuff, but such that they cannot be recognise, but this did include a kilt to represent Jamie and one of the green coats is intended for the Eighth Doctor. I never knew that SO much had gone into this blink-and-you-miss-it shot, but I guess this sort of stuff is there for the fans – and the DVD pause button! How cool! I had no idea! I mean I had assumed there were a few references, but I didn't know how much they had put in there. Scary to think it has been about 4-5 years since this episode came out, and I STILL didn't know! Possibly - I'm not so convinced. 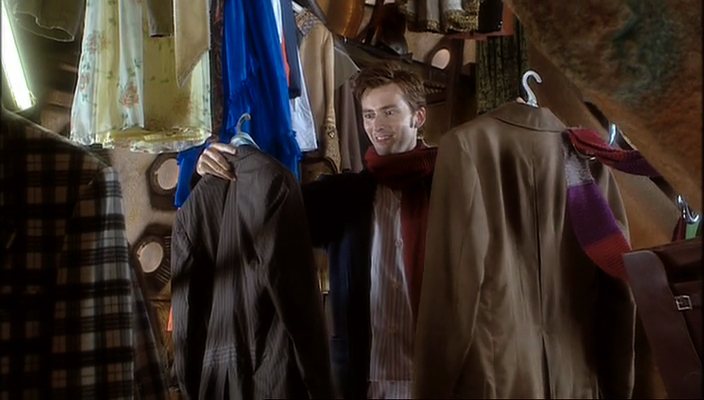 I had a look around, and could only seem to find him wearing one red jacket, which doesn't look quite the same. I know this isn't about the costume, but did you spot the mistake in the Christmas Invasion when the Doctor walks up to the mirror when he's trying on his new brown suit. 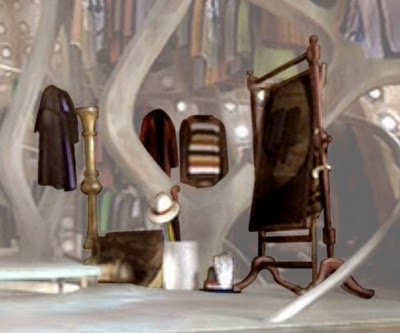 You can see the TARDIS doors and handrails to the left of the mirror!